CSKA Moscow stayed in the running for first place in Group D by fighting off a gritty Brose Baskets Bamberg 89-97 at Stechert Arena in the Turkish Airlines Euroleague on Thursday. Dionte Christmas nailed 6 three-pointers in scoring a team-high 21 points for Moscow, which improved to 7-1. Nenad Krstic returned from his injury break with 18 points while Milos Teodosic added 19 points and 9 assists. 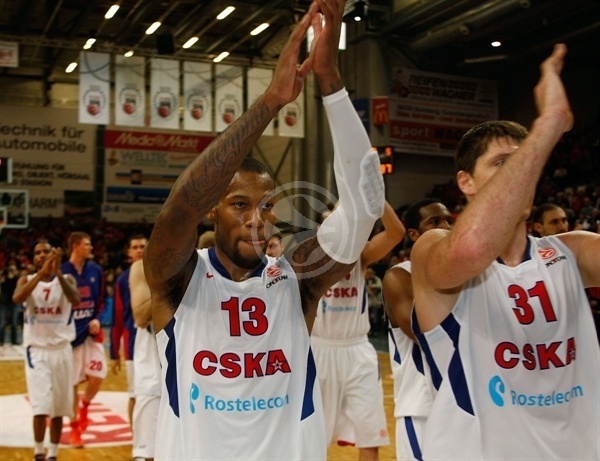 Sonny Weems picked up 16 points for the winners and Viktor Khryapa added 11. Bamberg dropped to 2-6 despite five players scoring in double figures led by 18 points from Casey Jacobsen, 16 from Anton Gavel, 15 from Bostjan Nachbar and 10 each from Teddy Gipson and Philipp Neumann. Bamberg went with the same starting five as last week with Gipson, Nachbar, Jacobsen, Gavel and Maik Zirbes. Moscow made one change with Christmas replacing Anton Ponkrashov alongside Teodosic, Sasha Kaun, Khryapa and Weems. Zirbes got Bamberg on the scoreboard first with a free throw before Christmas nailed a three to start the game for Moscow. Zirbes knotted the game inside and Nachbar’s driving layup gave Bamberg its first lead 5-3. Gipson and Nachbar both knocked down jumpers and the Brose advantage was 9-5 as Moscow could not hit its jump shots. CSKA eventually found its offensive rhythm with Christmas hitting another triple, Teodosic driving in for a layup and Weems racing in down the right baseline for a power funk and a 9-12 lead. Khryapa’s three-pointer increased the gap to 11-15 and the CSKA cushion was 12-17 after a Teodosic jumper. John Goldsberry and Jacobsen both knocked down long balls as Bamberg pulled to within 18-19. Andrey Vorontsevich and Jacobsen swapped baskets before Christmas nailed yet another three-ball for a 20-24 lead. Sharrod Ford hit a jumper in the lane for Bamberg but Teodosic made a free throw and a fall-away jumper to push the CSKA advantage to 22-27. Goldsberry temporarily trimmed it to 3, but Krstic raced back for a layup just before the buzzer as Moscow led 24-29 after one quarter. Vorontsevich opened the second period with a three pointer and Weems followed Nachbar’s jumper with a three of his own. Krstic’s layup made it a double-digit lead 26-37. Neumann and Jacobsen were able to cut the deficit to 30-37, but Aaron Jackson’s three-point play re-established a 10-point advantage. Gipson and Teodosic swapped long balls and Weems fed a nice ball to Krstic for a dunk and a 35-45 lead. Gavel twice hit layups to trim the deficit to 39-45. But Teodosic found a wide open Vladimir Micov for a layup and Krstic’s layin gave Moscow the lead 39-50 at the break. Both teams were on target from long range in the second half as Gavel opened the third quarter with a triple only to be answered by a Khryapa triple. Nachbar hit the next three-ball and was fouled and converted for a four-point play before Gipson’s jumper trimmed the margin to 48-53. 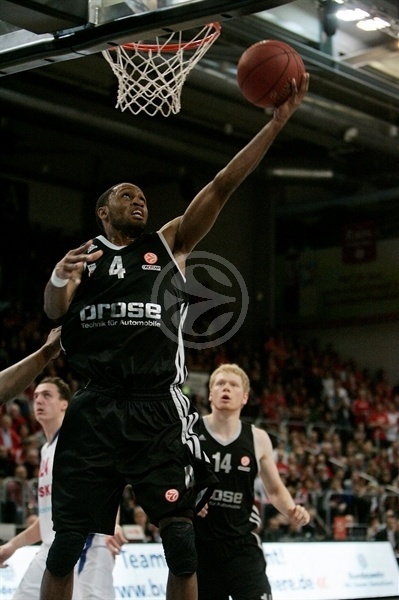 Weems silenced the Bamberg crowd with a tough jumper, but Gavel nailed another three-ball as Bamberg was within 51-55. Weems again hit a tough shot and another three-ball from Christmas increased the cushion to 53-60. 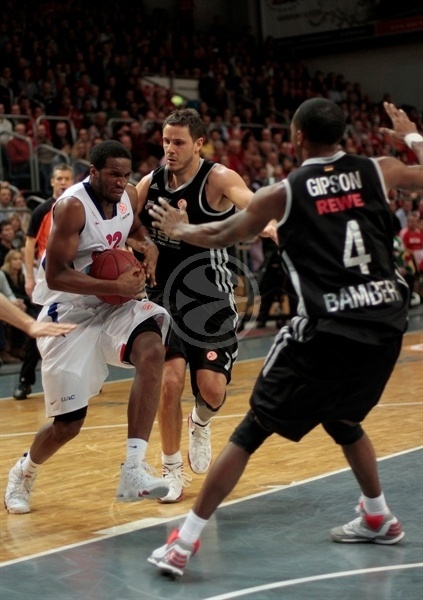 Zirbes twice scored inside, the second time completing a three-point play as Bamberg was within 58-60. The CSKA inside-outside game was working with another long ball from Christmas and two inside scores by Krstic for a 60-67 lead. Jacobsen nailed a three ball and Gavel knocked down a free throw to bring Bamberg within 64-67 after three quarters. Neumann opened the fourth for the hosts with two straight baskets, but Krstic twice matched him down low to make it 68-71 before Christmas made 3 free throws after being fouled shooting from long range to increase the advantage to 68-74. A Weems jumper made it 68-76. Nachbar and Goldsberry both knocked down jumpers as Bamberg would not let Moscow pull away 72-76 with six minutes to play. Khryapa however was on target from long range and CSKA was ahead 72-79. Neumann picked up a loose ball and dunked it and Gavel hit a tough lefty layup to inch Bamberg within 76-79. 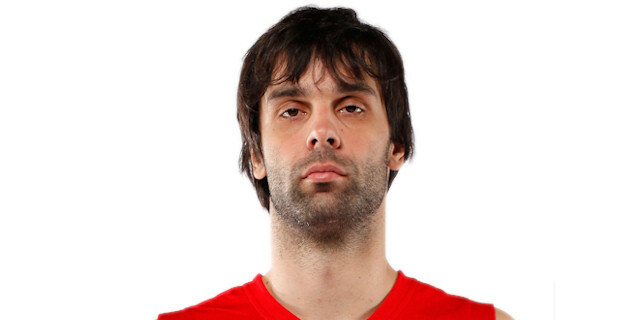 Teodosic was the next Moscow player with a big shot, nailing a triple for a 76-82 cushion with four minutes left. After 2 free throws from Kaun, Jacobsen knocked down a three-ball to trim the margin to 79-84. It was 80-84 after Zirbes’s free throw, but Weems made 2 foul shots and Christmas dropped another three-point present for Moscow to establish an 80-89 lead with 1:43 remaining. Teodosic sandwich two sets of free throws around a Jacobsen three to keep Moscow ahead 93-84 with 54 seconds left. Bamberg refused to go down without a fight with Gavel nailing another triple to pull within 87-93. 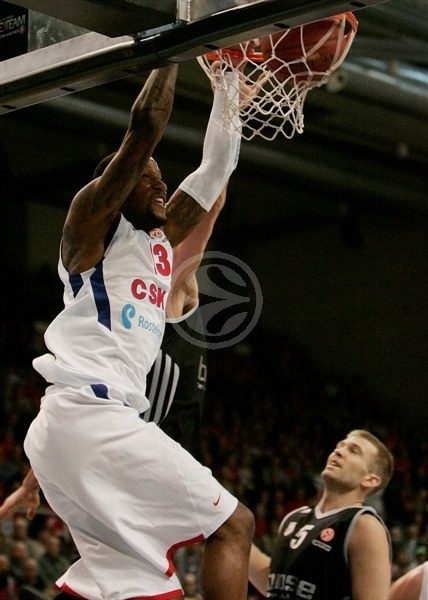 But Weems calmly sank 2 foul shots and Khryapa did the same with 27 seconds remaining for a 10-point lead – 87-97. "Congratulations to CSKA on a good road win. I think any time you go on the road and score 97 points, you’ve earned a win. For us it’s disappointing to shoot 60 percent from the floor and lose at home. If we are going to be successful in the coming weeks in the Euroleague, we need to find our pride defensively to get through to the Top 16. There’s no way we’re getting there without defensive pride. We’ve got a couple of guys who get it; we need a whole group of them. "Congratulations to both teams. It was a good game from both teams. We beat a good Bamberg team. They hit a lot of good shots, even though we were fighting well on defense. The fact that we only had 6 turnovers and 20 assists speaks for itself. We are improving and getting better. Hopefully when the Top 16 comes, we will be where we want to be." "It was an offensive showcase tonight. That’s a lot of points in a Euroleague basketball game. In the last couple of years, I can’t think of a better offensive game that we’ve had here. So to lose a game like that is really, really hard to swallow. Defensively we just weren’t good enough tonight. I know that Moscow is good, I know that people don’t think this is an upset, but to me I totally expected to win. And if you would have told me that we would have had 22 assists and only 10 turnovers, we shoot 60 percent from the field and score 89 points, I would have guaranteed a victory. I really would have. I’m just really disappointed. But we have to look in the mirror. It’s not like they scored 97 points by accident. They are a good team, but we also made mistakes that we have to learn from and if we want to be a Top-16 worthy team, we can’t give up 97 points to anybody, I don’t care who it is. " 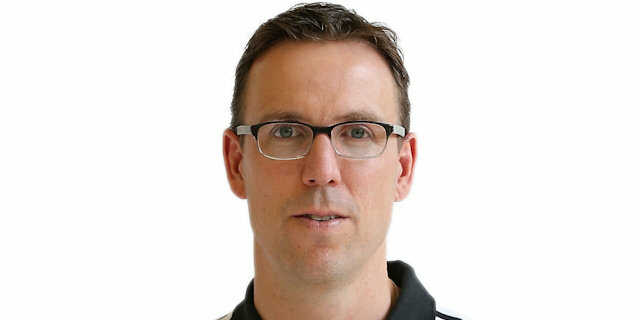 "We knew nobody wins easily in Bamberg. We played a tough game with lots of points scored. I am happy we won, but for us it is most important that we still have a chance to take the first place in our group. We still need to win two more games to finish first, but even if we finish second it will not be that big of a difference. But I think our team started going up and we are playing much better now. My teammates helped me a lot to play a good game tonight."